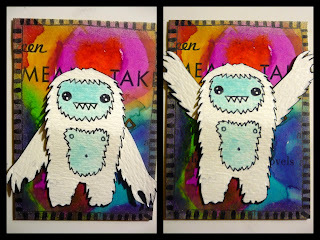 Tonight I painted a bunch more watercolor textures for my papercrafting and then made this yeti ATC! His arms are anchored with brads behing the yeti's body, so they are completely movable... Well, movable in two directions: up and down. "I eat snow food and live in a rainbow cave"
"Oh hi fish! You're pretty cool, let me touch your head for some reason."